Halloween is a huge season on Pinterest. In fact, there are 29 million ideas saved by 21 million Pinners each year according to *Pinterest. What are Pinners searching for during Halloween on Pinterest? The biggest topics that Pinners are searching for are costumes, decorations, food, and makeup when it comes to Halloween on Pinterest. How can you take these four big topics and create content for your niche? Here are a few ideas for you. As you know, Pinterest users are a little crafty. Most Pinners want to make their own Halloween costume or use the items they already own to put together a costume. Are you a pattern maker who helps people sew? What hacks can you share to take an everyday pattern and make it into a Halloween costume? When I went as Eleven from Stranger Things, I piecemealed a few patterns together to create the perfect pink dress with a pintucked front and a Peter Pan collar. Are you a clothing retailer? What clothing pieces can you put together to create simple costumes? Can you help people create a hipster version of their favorite Disney character? I’m thinking about those hipster Disney Princess memes. Those would make amazing costumes! Beauty bloggers make sure to provide Pinners with some amazing and easy makeup tutorials to go along with these costumes. From bloody and gory stage makeup to whimsical and fantasy makeup, provide a variety of ways to help those Pinners. Pinners typically love to get together with friends and family, so many of them are looking for Halloween Movie Marathon ideas. Give them a viewing calendar or a Halloween Movie checklist to make it easy and fun. Are you a mommy blogger? Think about a family-friendly movie checklist complete with easy, DIY snacks for the kiddos. Or are you a food blogger? What cocktails are the perfect addition to the scary Halloween movies? Give Pinners an easy way to entertain their family and friends. What crafts can you share with Pinners to make during their Halloween Movie Marathon? There are all kinds of ideas to go with this seasonal activity. You could even share the best outfits to wear to a watch party! Are you a home decor blogger? Then this is for you! Halloween on Pinterest is huge in regards to decor! Home decorations, yard decor, and easy tutorials are going to help the Pinner impress their guests at their Halloween party. Last-minute DIY decorations and recipes will help those throwing a Halloween bash. A shopping guide or list of everyday items to create these scary decorations is a great idea! Even think about costume contests, BINGO, and other games that party-goers will want to play. Remember to take bigger ideas and niche them down for your target market. Family parties are going to be much different than a young adult party. Think about budget-savvy parties vs the no-expense-spared parties and how you can offer varying ideas for all levels. What party is complete without a spread of food and drinks? Share your best recipes and give them a Halloween spin! Themed cocktails and entrees can really make for a killer party. 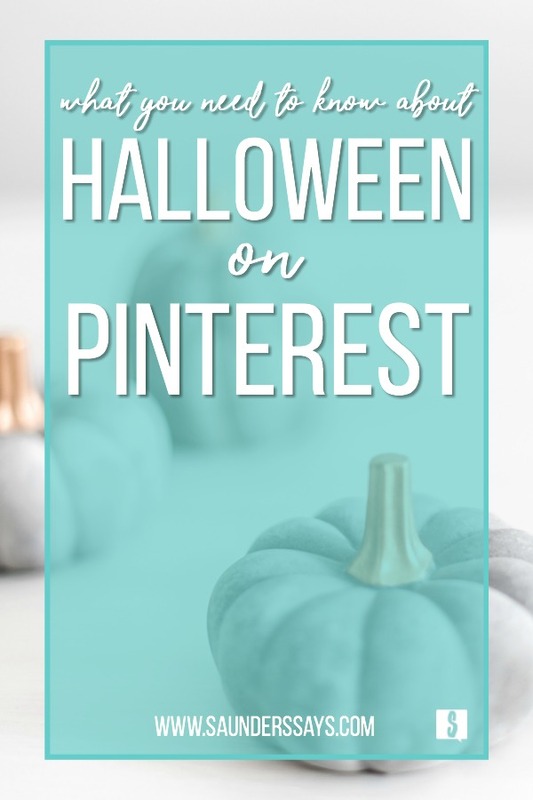 From costumes and makeup to games and food, I hope this information about Halloween on Pinterest will help you create amazing content this season. Regardless of what niche you’re in or who your ideal client is, make sure to write the best Pin descriptions and use keywords to get your content found! With all this information at hand, how do you plan to help Pinners this season? Prefer to watch or listen instead of read? Here’s a video to summarize all things Halloween on Pinterest!